← Happy ones know God, unhappy ones, sad ones, do not know Him. This early morning, we ask: why would anyone choose to be unhappy, to be sad? Tax the rich? Yeah? Tax this. Was your daddy rich? Was he rich like this? 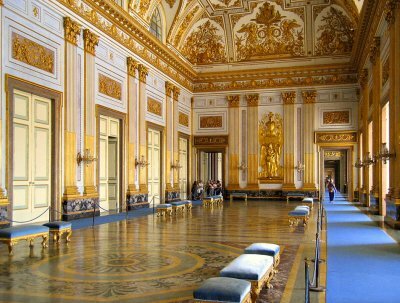 Royal Palace, Caserta, Campania, Italy. The Lesser Drawing Room. Not far at all from the perfect Isle of Capri. Some guys just chose the right daddy. Whom did you choose for your daddy? When you were small, did you ever form the impression that there was something going on out there that nobody told you anything about–at all? To wit, did your daddy have a lesser drawing-room like that? Do you even know about Caserta to this day? And there’s more–much more—Go ahead, have a look around the place. Un video bellissimo!!! And then, look some more–much, much more. Instead of being told about this palace of one very lucky man, we were force-fed cheap pop philosophy and even cheaper pop economics and told that we must tax the rich. Who are these dread-full rich so needing taxin’ today? Are they rich like this Caserta Palace fella? The Royal Palace of Caserta (Reggia di Caserta) is a large 18th-century palazzo situated in the Italian town of Caserta, the successor of ancient and medieval Capua. The town is the capital of a province of the Campania region and is situated 28 km from Naples. Its growth dates from the 19th century. The Bourbon king Charles VII of Naples (from 1759 King Charles III of Spain) decided to make Caserta the site of a royal residence in imitation of Versailles. His choice was based on the excellent local hunting and the perceived lack of vulnerability of his palazzo at Naples in the event of a popular uprising or an attack from the sea. The building was designed by Luigi Vanvitelli and executed between 1752 and 1772. It was inhabitable from 1775 onwards and in the late 1770s and during the 1780s such artists as Fidele Fischetti and Domenico Mondo produced frescoes for various rooms. It was not fully furnished until the mid-19th century. Charles of Bourbon never lived in it; his son Ferdinand IV did so only occasionally, and it only fulfilled its intended purpose as a royal residence for the Bourbons between 1830 and 1860. The royal palace of Caserta, standing as a self-contained block in a flat site, is of striking appearance . The five-storey façade (253 m×49 m) has, however, a certain monotonous quality exacerbated by the absence of the architectural and ornamental additions intended by Vanvitelli. Reggia di Caserta’s interior is more animated: it is divided into four equal-sized oblong courts radiating from a dramatic central octagonal vestibule, where Vanvitelli employed scenographic principles to lead the viewer through a series of imposing vistas. The main axis is primarily for communication, while the transverse axis leading from the vestibule contains the ceremonial staircase, chapel and theatre. The chapel and to a certain extent the theatre were modelled on those at Versailles. The chapel of Caserta Palace presents a lavish display of marble work and incorporates several paintings, including a Presentation in the Temple by Anton Raphael Mengs and an Immaculate Conception by Giuseppe Bonito. Although the grand marble staircase is the area of greatest magnificence, the masonry throughout the building is beautiful in its precision. The formal gardens of the Caserta Palace were laid out according to French textbook rules by Martin Biancour under Vanvitelli’s supervision. The dominating axis is about 3 km long from the palace entrance to the waterfall at the end of the park and was intended to be prolonged in the opposite direction as a road reaching all the way to Naples. A broad stretch of water, the canalone, with large fountains, occupies the length of the vista which ends at the great cascade at the foot of the mountain. To one side is a garden in the English style with rare plants. On the city side of the palazzo, Vanvitelli developed only the schematic design seen in the bird’s-eye view in his Dichiarazione, with an oval forecourt housing barracks and stables and roads radiating outwards. The town later developed to one side of the palazzo and not in front of it as originally envisaged. Think about this: We are left with the Zombies pop band and childlike speeches about taxing the rich–men who no longer exist to begin with. So, did we chose a good deal or a bad one for ourselves when we were small and, yet years on, today?